Think Ferris wheels, roller-coasters, carousels, flying swings, and bumper cars! Open your Carnival for business before the other carnies do by building four of the five available rides along your Midway. Then cue the Carnival music and watch the crowd rush in! Carnival is Dice Hate Me Games’ first publication. It is a product reflecting the designers’ dedication, philosophies, and most importantly, their passion for games. I challenge anyone to play this game without humming, whistling or ‘singing’ that “carnival song”. You know the one – don’t pretend you don’t. 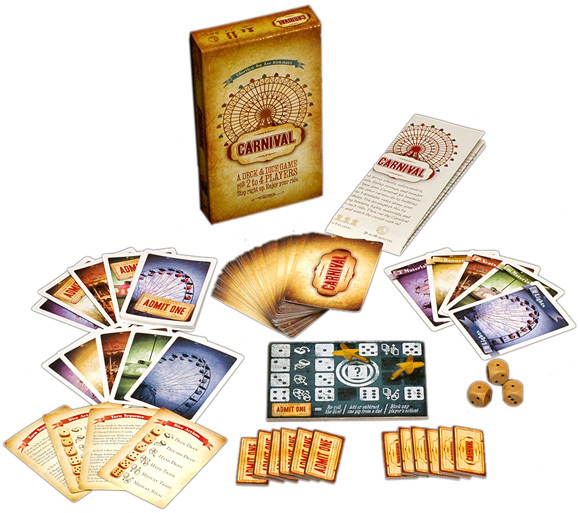 Carnival is a set collection game in which each player is trying to be the first to assemble four out of five rides. Assembling a ride is simply collecting one of each of the four components of a ride : Seats, Lights, Banners and Materials – all represented by wonderfully themed artwork. Typically your turn will involve a game of chance – rolling three dice and picking two. The numbers on the dice represent actions you can take; drawing new cards, stealing cards from another player, etc. You will then be able to start construction of new rides or add on to an existing ride. Wild cards are also included – which can take the place of any needed components of a ride if necessary, or can be used to discard some of your hand to replace with new cards. The final component included in the game are tickets – used to modify dice rolls, or prevent an opponent’s action. You are limited to three with an ability to acquire more, so saving them for the appropriate time is an important consideration of game play. Carnival is a simple game from a newer company – funded through Kickstarter. Overall the game is a wonderful set collection card game which fits in well with families and gamers alike – if a light game is what you are after. The only downside is that the designers appear to worked hard to fit their rules onto one page – which makes some of the rule specifics hard to find. P.S. – The name of “that” piece is Entrance of the Gladiators, composed by the Czech composer Julius Fučík. You can listen to it here. Add a Review for "Carnival"